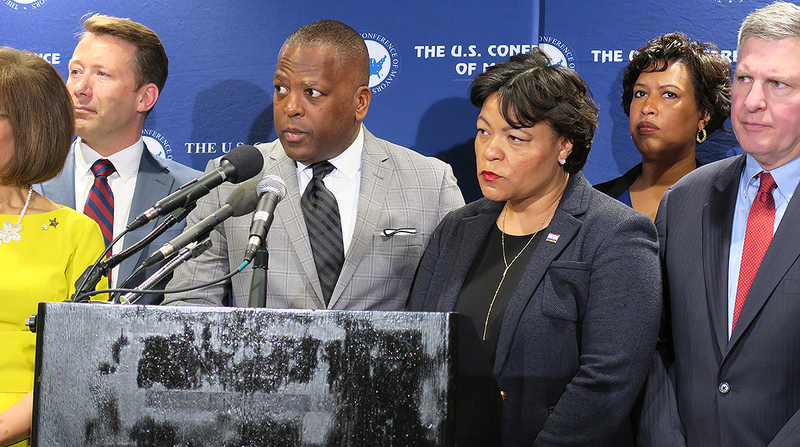 Members of USCM’s infrastructure task force, led by Los Angeles Mayor Eric Garcetti and New Orleans Mayor LaToya Cantrell, have advocated for an infrastructure deal in meetings with administration leaders such as Treasury Secretary Steven Mnuchin. Benjamin, who also is USCM president, said meetings with leaders and lawmakers will increase this year. President Donald Trump’s proposed infrastructure plan places an onus on state and local government agencies to raise funds. The funding principles unveiled Feb. 12, 2018, would rely significantly on nonfederal funds to reach a $1.5 trillion top line over 10 years. Overall, $200 billion in direct federal funds would be sought to achieve the plan’s desired top line. Benjamin pointed out that metropolitan areas were responsible for 99% of growth and economic input over the past year and said that infrastructure investment is needed to maintain these centers. He said more than $4 trillion is needed to address critical infrastructure issues. USCM’s infrastructure task force prioritizes investments in state and local block grants for transportation, harbor maintenance, water system repair and addressing climate change needs. Garcetti, Cantrell’s counterpart on the infrastructure task force, stayed in Los Angeles to reach a compromise on the teachers strike. USCM’s meeting started on the 33rd day of a partial government shutdown. Although the Highway Trust Fund remains operational, state and local officials have started to feel the shutdown’s effects as it wages on. For example, Atlanta Mayor Keisha Lance Bottoms said that her city, home to the busiest airport in the country and host of the Super Bowl, is expecting a major influx of travelers for the Feb. 3 game. She said that she and her counterparts have arranged for Transportation Security Administration workers, many of whom have been working without pay since Dec. 22, to open lines early on the Monday after the game to help deal with massive crowds. Many mayors formed a chorus of voices expressing frustration over the shutdown and calling for national leaders to work together.